Logistical support from the Méxican Navy enabled researchers to measure seven fumarole and hot spring temperatures on 2 February 1995 in the summit region of Socorro Island's Mount Everman. Previous measurements, taken on 5-12 February 1993, were made at the same sites. These sites, labeled A-G, are shown on sketch maps and tables in Siebe and others (1995) and BGVN 18:01. In this most recent series of measurements, all temperatures were 90°C, except site D, which was 74°C. The 1993 measurements were made in conjunction with a local submarine eruption that also produced T-wave signals. These new measurements showed a several-degree increase over many of those in 1993. The 1993 eruption was seen at the ocean surface over the island's submarine W flanks; during this visit further signs of eruption were absent from the ocean's surface and from distant hydrophones. Unfortunately, local hydrophones on the S end of the island were not operational. Several hundred meters N of the summit, on North Dome, the visitors saw recently killed vegetation and dead trees on the margins of some hydrothermally active pits. They also noted soft warm ground, dead bracken, and newly established pits, suggesting reactivation. In other cases green trees grew in the pit walls. While the majority of the fumaroles appeared similar to those in 1993, the observers noted three 'mud volcanoes'; two were active and the third issued deep rumblings. A stream in the vicinity of the summit and North Dome had a temperature of 60°C and numerous 80°C springs were seen both along its bed and nearby. Reference. Siebe, C., Komorowski, J-C., Navarro, C., McHone, J., Delgado, H., and Cortes, A., 1995, Submarine eruption near Socorro Island, Mexico: Geochemistry and scanning electron microscope studies of floating scoria and reticulite: Journal of Volcanology and Geothermal Research, v. 68, p. 239-71. Information Contacts: Andrew M. Burton, OCEAN, Organizatión para la Conservación Estudio y Análisis de la Naturaleza, A.C., 22 de Diciembre No. 1, Col. Manuel Avila Camancho, Naucalpan, Edo. de México. The Global Volcanism Program has no Weekly Reports available for Socorro. Eruptive activity at Socorro Island (figure 1) was first observed at 1745 on 29 January 2.4 km NW of Punta Tosca (figure 2) by underwater photographers aboard the "Mystique." When the boat approached a steam column, they observed hot, dark-colored rocks ~1-3 m across breaking the surface in an area of ~50 m2. Depending on the specific block, there was production of hissing noises, steam, jets of white vapor several meters high, violent fracturing, or fragmentation that sent clasts to 50 m height. No explosive activity or volcanic plume was observed. Depending on vesicularity, blocks either sank or floated; floating rocks covered an area of ~6,000 m2 by 31 January. Depth soundings gave depths of 138-149 m in an area where a large number of gas bubbles were being generated, presumably by degassing of rising lava clasts. Activity had decreased by 3 February, when only eight blocks were seen at the surface, but the Mystique reported that activity fluctuated during the day and between days. Another depth sounding recorded a depth of 519 m.
Figure 1. Location map and general geologic map of Socorro Island showing three major eruptive units (from Bryan, 1966 and 1976). Figure 2. Sketch map and interpretive cross-section of the SW part of Socorro Island with location of submarine activity W of Punta Tosca. Courtesy of Ignacio Galindo. Juvenile material collected by Mystique divers is described by geologists as black to greenish, semi-translucent, highly vesiculated glass with vesicles up to 5-10 cm in diameter and abundant large (10-15 mm) gray tabular plagioclase phenocrysts. Activity observed by geologists on 4 February (1245-1700) had a radius of about 1 km, centered at 18.81°N, 111.08°W, about 3.14 km from Punta Tosca and 4.63 km from Cape Henslow on Socorro Island. Water depth, determined by echo-sounding, was 80 m about 200 m SE from the most active area, and rapidly increased to more than 200 m travelling E towards the island. Although the data is only an approximation due to the difficulty of approaching the vent area, a sharp rise in the ocean-floor topography below the most active area is indicated. Very hot scoriaceous lava blocks, ranging in size from several centimeters to 2-3 m, were observed quickly rising to the surface and producing activity similar to that described earlier. Blocks then either floated away or sank, with some being propelled along the surface by steam and effervescence. The vent area was difficult to precisely locate because of strong wind and waves causing the blocks to drift. Most of the time, three distinct and separate areas were observed, somewhat aligned, where the majority of lava fragments were rising. Seawater temperature was normal, but a light sulfurous odor was detected. A helicopter inspection from 1815-1835 observed an accumulation of blocks below the surface from which large (up to 5 m) blocks detached and rose to the surface. Some type of spine from which blocks were being released was confirmed by an overflight about 15 m above the surface. A helicopter reconnaissance flight the next day (1005-1059) observed activity similar to previous days. About 100 rocks could be seen at any one time during 20 minutes of overflight at 5-10 m above the surface, and there was a strong sulfurous odor. New fragments continuously rose to the surface with a trail of bubbles in two distinct areas about 100 m apart. Wind and waves again made it difficult to define the vent area. Elongated bands of fine gray solid matter floating on the surface, observed from higher altitudes, are interpreted as finely fragmented suspended scoria. There was no evidence of juvenile material accumulating close to the surface or above it. Another helicopter flight that afternoon did not observe any evidence of hot floating scoriaceous rocks. Reports from Naval personnel based on visual observations from the sea and air indicate continued submarine activity through 17 February, but no accumulation of material above the surface. The summit fumarole area of Everman volcano on Socorro Island exhibited no unusual activity during a 5 February visit. The summit lava dome complex, composed of abundant obsidian and other less vitric lavas, did not contain any fumaroles. However, below the summit to the NNE and NW, there are fumaroles at the base of a relatively young lava dome (figure 3), which appears to be the most recent feature in the summit area. The younger dome, which has obsidian margins, appears to have filled an older crater in a depression about 100 m below the summit to the N. The most active area is on the SE side of the N dome along an apparent zone of weakness with cracks to 1 m deep and 1 m wide. This zone includes areas of vapor, boiling water or mud, clay alteration, sulfates, and sulfur encrustations. Temperature measurements were taken at the major fumaroles (table 1). The largest and most continuously active fumarole produced a hissing sound. Water samples from a hotspring near fumarole F were obtained for analysis. An older dome SE of the summit also has some very small fumaroles. Overall, vapor emissions in the summit area do not seem uncommon for an active volcano. Figure 3. Topographic map of the summit of Everman volcano, Socorro Island, with location of major monitored fumaroles, and major structural features of the N lava dome. Light stipling indicates areas with intense fumarolic activity and hydrothermal alteration. Table 1. Temperatures (°C) measured in fumaroles in the summit area of Everman volcano, Socorro Island. All temperatures are thermocouple readings, except for location D, which was measured with a calibrated mercury thermometer. Location F contained several fumaroles and associated hydrothermal phenomena. Precursors were first recorded on 19 January, when an unusual clustering of randomly distributed impulsive hydroacoustic signals (T-phases) was observed on recordings from SOFAR channel hydrophones located near the island of Oahu, Hawaii. The T-phases were accompanied by elevated levels of background noise. Activity intensified at about 1000 GMT, and lasted approximately 1 hour. 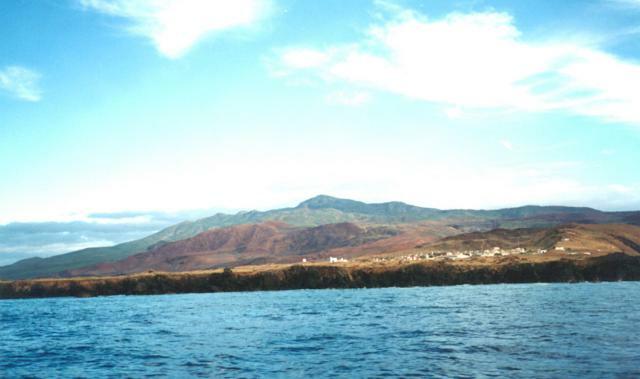 Based on the strongest phases recorded in Hawaii and at the LDG in Tahiti, the source was located near Socorro Island. Seismicity was felt by Mexican naval authorities on the island beginning on 16 January. A portable MQ-800 seismometer was installed on 4 February at the naval base on the island. Socorro Island is located ~716 km W of Manzanillo, Colima, and 480 km S of the tip of Baja California. Tectonically, it is located within a segment of the southernmost region of the East Pacific Rise, S of the Riverra Fracture Zone. Eruptions have been reported in 1848, 1896, 1905, and 22 May 1951, but there are no clear details about the eruptions or their effects. The island is a compositionally diverse volcanic complex that rises about 4,000 m from the surrounding ocean floor. Based on recent 40Ar/39Ar dating, the surface is estimated to be 540 Ka old. The youngest reported age, from a lava flow on the S side of the island, is about 15 Ka, but probably does not represent the youngest unit. There are about 60 men, stationed at the Mexican National Navy base, living on the island. References. Bryan, W. B., 1966, History and mechanism of eruption of soda-rhyolite and alkali basalt, Socorro Island, Mexico: Bulletin of Volcanology, v. 29, p. 453-479. Bryan, W. B., 1976, A basalt-pantellerite association from Isla Socorro, Islas Revillagigedo, Mexico, in Volcanoes and Tectonosphere, H. Aoki, and S. Iizuka, eds., p. 75-91. Information Contacts: Gustavo Calderón, Instituto de Oceanografía de Manzanillo, Las Brisas, Manzanillo, Colima, México; Ignacio Galindo, Carlos Navarro, and AbelCortés, CUICT, Univ de Colima, Apartado Postal 380, CP 2800, Colima, México; Jean-ChristopheKomorowski, ClausSiebe, and HugoDelgado, Instituto de Geofísica, UNAM, Coyoacán, 04510, México DF, México; BillChadwick, ChrisFox, and BobEmbley, NOAA, 2115 SE Osu Drive, Newport, OR 97365 USA; Charles S. McCreery and Daniel A. Walker, Univ of Hawaii at Manoa, Hawaii Institute of Geophysics, 2525 Correa Road, Honolulu, HI 96822 USA; J. Talandier, LDG Tahiti; Wendy Bohrson, Dept of Earth & Space Sciences, UCLA, 595 Circle Drive East, Geology Bldg., Room 3806, Los Angeles, CA 90024 USA; Bob Talbot and Charlie Peck, Bob Talbot Productions, P.O. Box 3126, Rancho Palos Verdes, CA 90274 USA. Socorro, the SE-most of the Revillagigedo Islands south of Baja California, is the summit of a massive, predominately submarine basaltic shield volcano capped by a largely buried, 4.5 x 3.8-km-wide summit caldera. A large tephra cone and lava dome complex, Cerro Evermann, forms the summit, and along with other cones and vents, fills much of the Pleistocene caldera. Rhyolitic lava domes have been constructed along flank rifts oriented to the N, W, and SE, and silicic lava flows from summit and flank vents have reached the coast and created an extremely irregular shoreline. Late-stage basaltic eruptions produced cones and flows near the coast. Only minor explosive activity, some of which is of uncertain validity, has occurred from flank vents in historical time dating back to the 19th century. In 1951 a brief phreatic eruption ejected blocks, and the gas column reached 1200 m altitude. 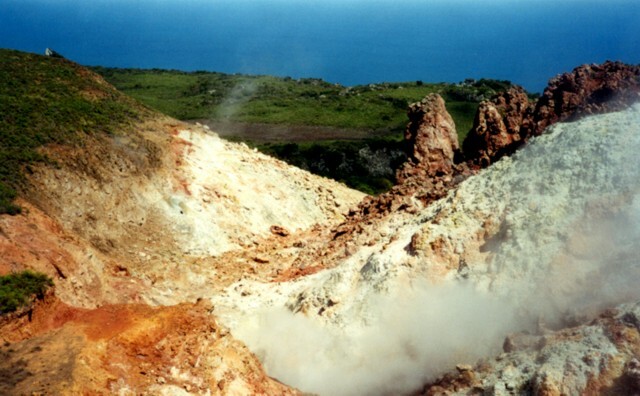 A submarine eruption occurred during 1993-94 from a vent 3 km W of the island during which large scoriaceous blocks up to 5 m in size floated to the surface without associated explosive activity. Bohrson W A, Reid M R, 1995. Petrogenesis of alkaline basalts from Socorro Island, Mexico; trace element evidence for contamination of ocean island basalt in the shallow ocean crust. J. Geophys. Res, 100: 24,555-24,576. Bohrson W A, Reid M R, 1997. Genesis of silicic peralkaline volcanic rocks in an ocean island setting by crustal melting and open-system processes; Socorro Island, Mexico. J Petr, 38: 1137-1166. Bohrson W A, Reid M R, Grunder A L, Heizler M T, Harrison T M, Lee J, 1996. Prolonged history of silicic peralkaline volcanism in the eastern Pacific Ocean. J. Geophys. Res, 101: 11,457-11,474. Bryan W B, 1976. A basalt - pantellerite association from Isla Socorro, Islas Revillagigedo, Mexico. In: Aoki H, Iizuka S (eds), Volcanoes and Tectonosphere, Tokyo: Tokai Univ Press, p 75-91. Bryan W B, 1966. History and mechanism of eruption of soda-rhyolite and alkali basalt Socorro Island, Mexico. Bull Volcanol, 29: 453-480. Siebe C, Komorowski J-C, Navarro C, McHone J F, Delgado H, Cortes A, 1995. Submarine eruption near Socorro Island, Mexico; geochemistry and scanning electron microscopy studies of floating scoria and reticulite. J. Volcanol. Geotherm. Res., 68: 239-271. There is no Deformation History data available for Socorro. There is no Emissions History data available for Socorro. 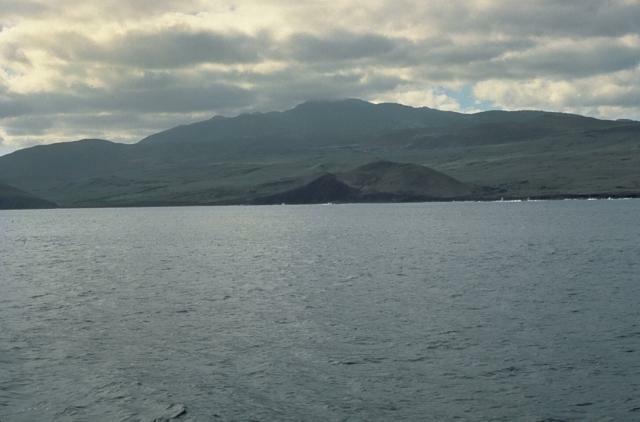 Socorro Island is the summit of a massive, predominantly submarine shield volcano that is capped by a largely buried, 4.5-km-wide summit caldera. Cerro Evermann (center), which forms the 1050-m-high summit of the volcano, is seen here from the south. Mild fumarolic activity continues at the summit lava dome complex. Rhyolitic lava domes have also been constructed along flank rifts, and silicic lava flows have reached the coast. Historical eruptions have been restricted to flank vents, including a submarine vent west of Socorro during 1993-94. Photo by Steve Nelson, 1989 (Tulane University). Cerro Evermann is a large tephra cone and lava dome complex that forms the 1050-m-high summit of Socorro volcano. It and other pyroclastic cones and lava domes largely fill a 4.5 x 3.8 km wide caldera at the summit of the Socorro shield volcano. Historical eruptions at Socorro have been restricted to flank vents. The summit tephra cone and lava dome complex of Cerro Evermann is viewed here from the SE flank. Obsidian lava domes and flows of soda rhyolitic and trachytic composition have filled most of the summit craters. Cerro Evermann lies within a 4.5 x 3.8-km-wide Pleistocene caldera that formed about 370,000 years ago and has been largely filled by post-caldera eruptions. The caldera rim is exposed at about 600 m elevation on the south and east sides of Cerro Evermann, where it forms a low, steep scarp 20-50 m high. Photo by Martha Marin, 1998 (Mexican Navy). The southern flank of Socorro volcano is underlain by rocks of three distinct origins. On the lower flanks are alkaline basaltic rocks of the Lomas Coloradas unit mostly erupted between about 150,000 and 70,000 years ago. The middle flanks contain precaldera and syncaldera trachytic and rhyolitic ashflow deposits erupted between about 540,000 and 370,000 years ago. The summit region, including Cerro Evermann (center horizon), consists of silicic peralkaline rocks erupted between about 180,000 to at least 15,000 years ago. Extensive hydrothermal alteration is visible in valley walls of a thermal area near the summit of Cerro Evermann. 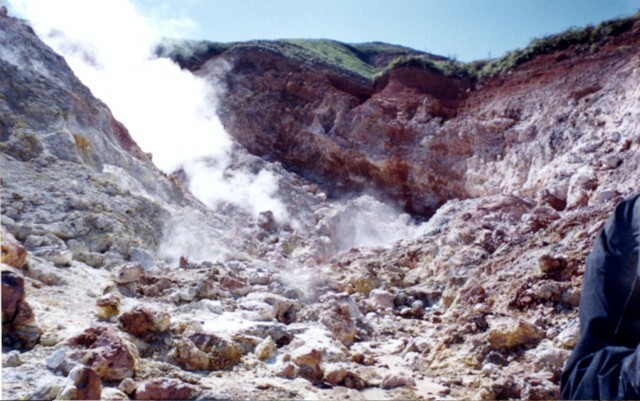 Steam rises from fumaroles in this 1998 view. The largest fumarolic vent is located at the head of a large barranca NE of the summit. During a 1957 visit by Mooser and Bryan, temperatures of 65-97° C were measured. Similar temperatures ranging from 61-101° C were measured in 1993. 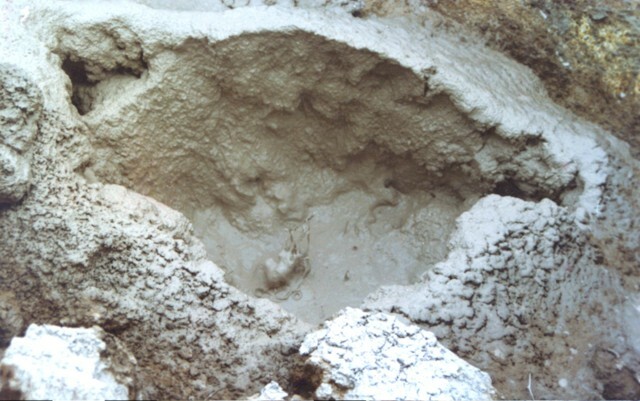 Mudpots are found at hydrothermal areas near the summit of Cerro Evermann. Fumaroles appear at the base of a relatively young lava dome, which is apparently the youngest feature in the summit area. This dome has obsidian margins and appears to have filled an older crater in a depression about 100 m below the summit to the north. The most active area is on the SE side of the north dome and includes areas of vapor, boiling water or mud, clay alteration, sulfates, and sulfur encrustations. 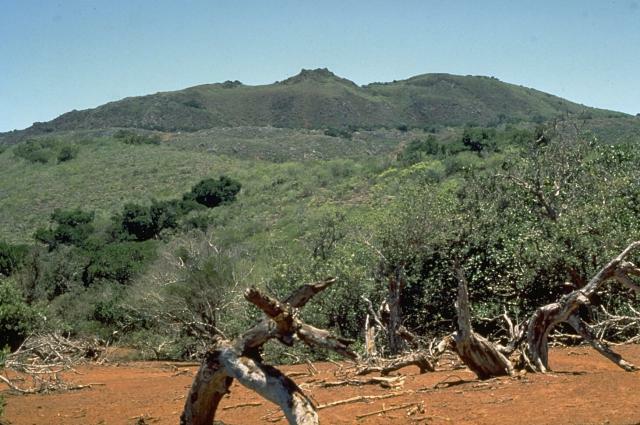 Cerro Evermann, the high point of Socorro Island, rises above a Mexican Naval camp near the southern tip of the island. Socorro lies in the Revillagigedo Islands south of Baja California. Cerro Evermann is a large tephra cone and lava dome complex that forms the 1050-m-high summit of the volcano. Rhyolitic lava domes have been constructed along flank rifts, and silicic lava flows erupted from summit and flank vents have created an extremely irregular shoreline. Only minor explosive activity has occurred in historical time. 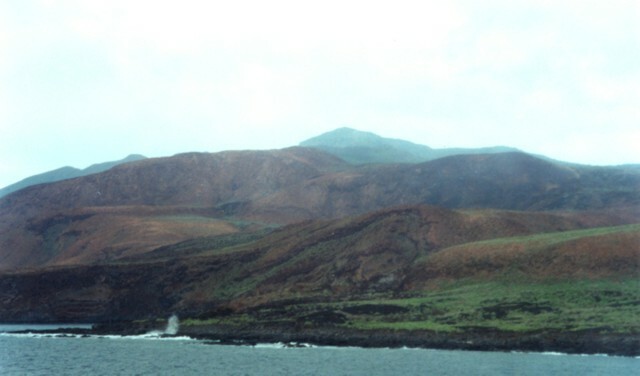 A pyroclastic cone lies along the SSE coast of Socorro Island, east of Cabo Rule (also known as Cabo Regla). 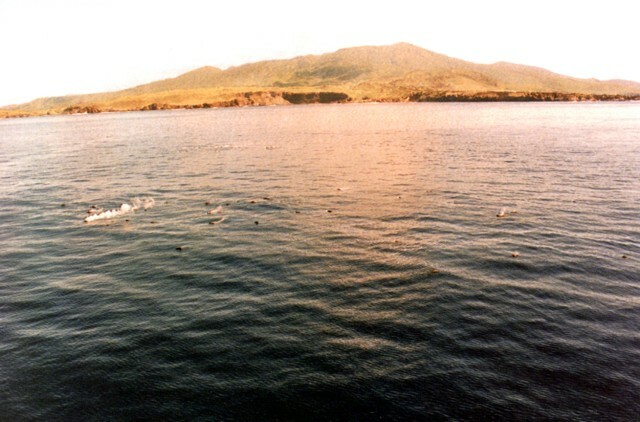 The peak on the center horizon is Cerro Evermann, the high point of the island. Basaltic cones and lava flows of the Lomas Coloradas formation blanket the southern tip of the island. 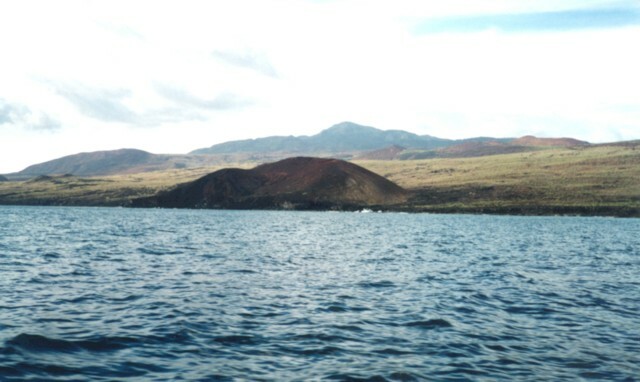 Although 80% of the surface of the island is covered by silicic post-caldera peralkaline lava domes and flows and few pre-caldera rocks are exposed, the bulk of the Socorro shield volcano is considered to be composed of basaltic rocks. Fumarolic areas at Socorro are concentrated near the summit of Cerro Evermann. They occur on all sides of North Dome, a young lava dome just north of the summit of 1050-m-high Cerro Evermann. The most extensive hydrothermal alteration is located in areas on the east, west, and SW sides of North Dome. 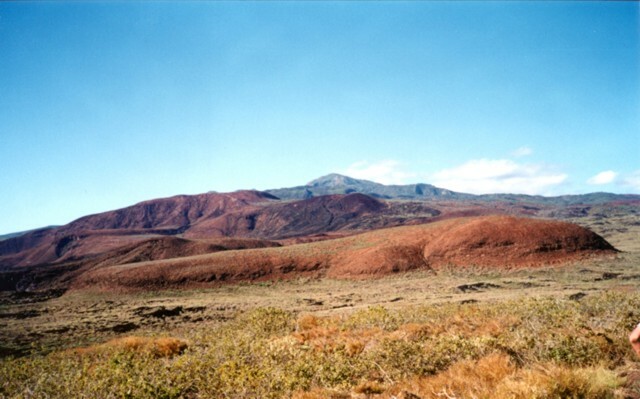 The northern, western, and southern flanks of Socorro volcano are dominated by silicic peralkaline lava domes and flows, which cover about 80% of the surface of the island. This view shows Cerro Evermann from the SW coast. Trachytic and rhyolitic lava flows from summit and flank vents extend into the sea and have produced a very irregular shoreline, with the distal portions of lava flows forming numerous small peninsulas. Trails of steam in the foreground rise from floating scoriacious blocks during a submarine eruption off the west coast of Socorro Island in 1993. The eruption, from vents about 3 km NW of Punta Tosca, was first observed January 29, 1993 following ten days of SOFAR signals recorded in Hawaii. Large scoriaceous blocks up to 5 m in size floated to the surface without associated explosive activity. 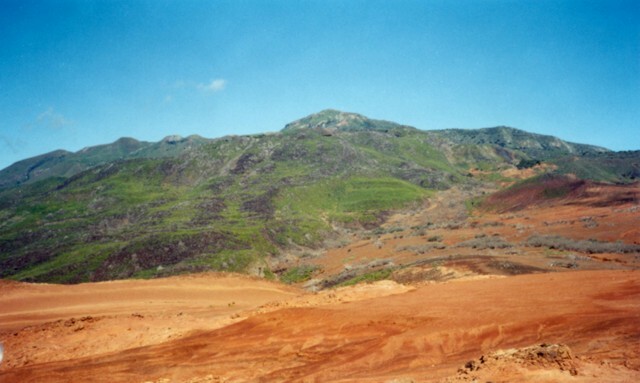 Floating masses of hot scoria were continuously erupted until at least the end of February 1994. 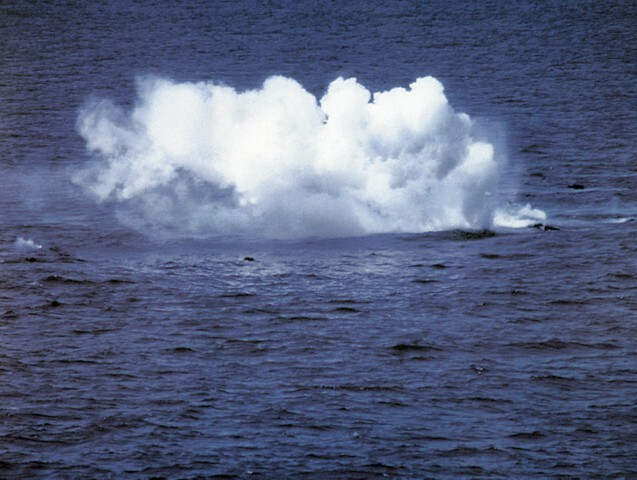 During a submarine eruption first observed on January 29, 1993, small explosions were produced as floating hot rocks fractured and their hot interiors came in contact with sea water. Large blocks of dark-gray, highly-vesiculated basalt up to 5 m in diameter rose to the surface. During individual pulses at irregular intervals, tens of blocks accompanied by effervescent bubbles could be observed rising buoyantly. The blocks emitted loud hissing and crackling noises from thermal expansion prior to breaking up into smaller pieces and sinking. 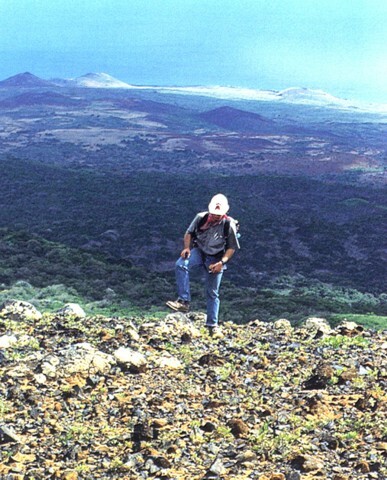 The Lomas Coloradas pyroclastic cones along the SW coast of Socorro appear in the background behind a geologist near the summit of Cerro Evermann. A brief phreatic eruption apparently occurred from a cinder cone west of the Lomas Coloradas on May 22, 1951, witnessed from a yacht anchored offshore at Caleta Binner. During a 5-10 minute period, a plume sequentially red, black, and then white rose a short distance above the cone, and bombs or blocks fell around the cone. The plume eventually reached a height of about 1200 m.
Photo by Hugo Delgado-Granados, (Universidad Nacional Autónoma de México). There are no samples for Socorro in the Smithsonian's NMNH Department of Mineral Sciences Rock and Ore collection. Large Eruptions of Socorro Information about large Quaternary eruptions (VEI >= 4) is cataloged in the Large Magnitude Explosive Volcanic Eruptions (LaMEVE) database of the Volcano Global Risk Identification and Analysis Project (VOGRIPA).